I just finished the last of a string of what I'm calling "Mama Reads" - books all centered around being a Mama, and this Mama just couldn't get enough! 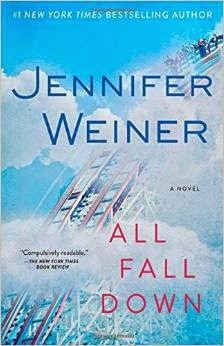 Though I am obviously not addicted to prescription pain killers (like the Mama in the first book), and I don't live in Australia (book number two), and I'm not a working mom (like in book number three), I still could relate to so much of what was going on in the lives of these characters, making them great reads. 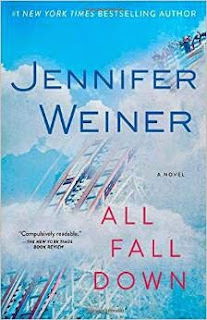 First was All Fall Down by Jennifer Weiner. This novel follows a wife and Mama as she copes with life's challenges by popping pills. She starts with prescription drugs, and her habit quickly spirals out of control. I found the details fascinating, from how she purchased the pills (illegally with bitcoin on the Internet!) to how she hid her habit. A unique and interesting read for sure. Next was Big Little Lies. 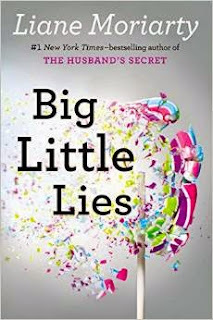 I had read about so many bloggers loving author Liane Moriarty; she seemed to be all the rage. But, when I picked up The Husband's Secret last year, I just couldn't get past the first chapter. All the different characters and voices to follow? I just wasn't up for it. Big Little Lies, however, was another "Mama Read"; it was speaking my language with all the Mamas in there. It had me hooked from the first page (despite the many different characters and voices, ha!). I loved that it also started with a crime that wouldn't be revealed until the end of the book (it made it quite the page-turner). This book followed a group of Kindergarten Mamas in Australia (I've always abbreviated kindergarten as "kinder" but they abbreviate it as "kindy" which I think is twelve kinds of adorable. I totally want to bring "kindy" to the U.S.). One has a husband who travels often for work, and I laughed out loud when she talked about secretly loving having him gone so she could eat toast for dinner. While I don't love it at all when Max is away on business, I will totally agree that pretty much the only perk to having him on travel is that I don't have to make dinner. Toast for dinner? That's so me. Except replace "toast" with "ice cream" (wink). I also felt for the teacher in this story. After teaching elementary school for seven years, I know quite well what it is like to field emails all day long from concerned parents - though it was interesting to see the teacher this time through the eyes of those parents and to be on the other side of the school drama. 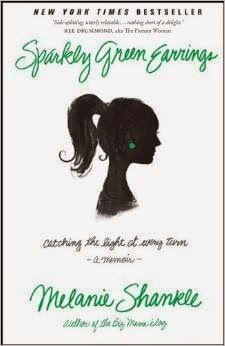 Finally, a light-hearted memoir called Sparkly Green Earrings. This book was written by a blogger, and it chronicles her journey to motherhood, as well as adventures in parenting. It was written with lots of humor - a perfect read if you want to put a smile on your face. It's also a great "you're not alone" book for those tough parenting days - sometimes it's just nice to hear other crazy stories to put everything into perspective.